For drinks, we asked for plain water (as drinks were not part of the vouchers, us- cheapskate wanna save a bit lah) but was told that, Nope, they do not serve plain water and what they can offer is mineral water. A quick flick of the menu, this costs RM5 for a small bottle, so we decide to go for ice lemon tea ( RM5) instead and the waiter recommended us to try Tea with hot milk which according to him was better than teh tarik. Ok, we will try that.. 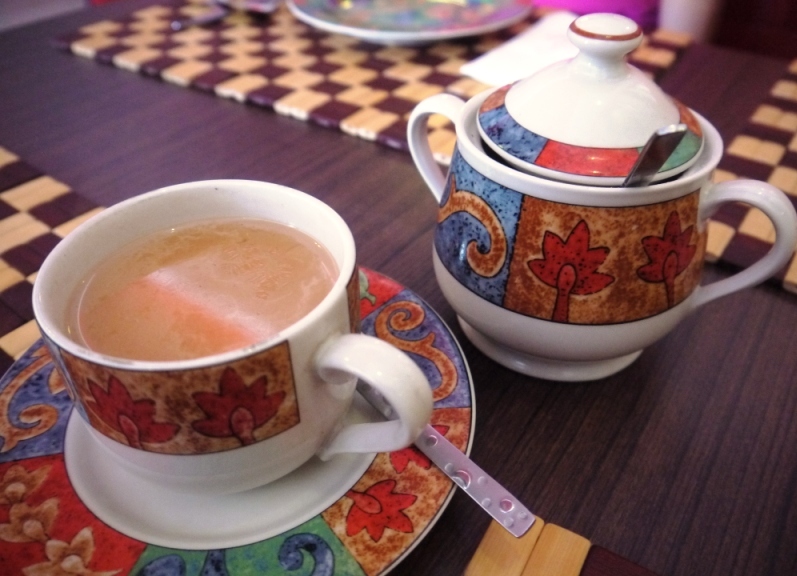 Tea with hot milk ( RM6)- the tea was light and smooth, but frankly I prefer my stronger and ‘heavier’ teh tarik with condense milk…or maybe I am too loyal to the mamak stalls.. 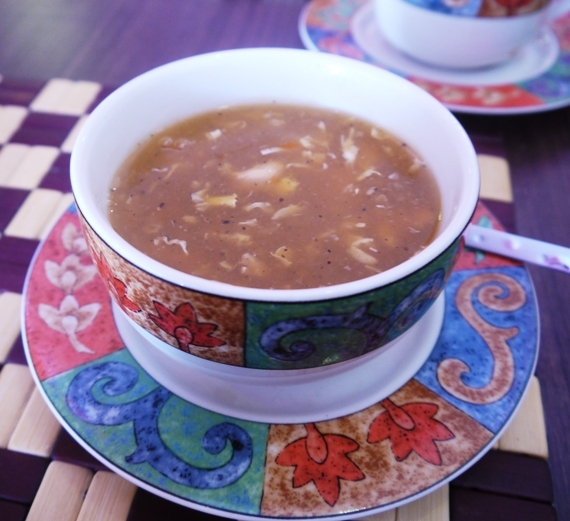 Hot and sour soup (RM10) , this was peppery and not too sour- taste a bit like a creamier version of the Chinese style sweet and sour soup. The green salad ( RM5) : at the centre of the salad was a very much dried up and shriveled green chili which I guess might have seen better days. 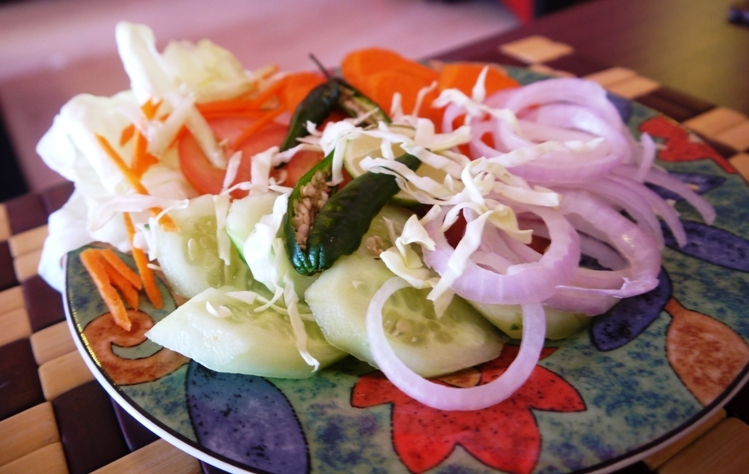 From a scale of 1 to 10, I will give a zero for the presentation of this salad, there are soooo many ways to make this dish prettier and more appetizing. Shesh Tawok (RM24) was cubes of grilled chicken and vegetables served with rice. I looked up the WWW, shesh means skewered and tawok is chicken and from wikipedia the common marinades are based upon yogurt or a tomato puree, though there are many variations. The chicken cubes were tender and the meat was fragrant. This was nice. The serving was rather generous. 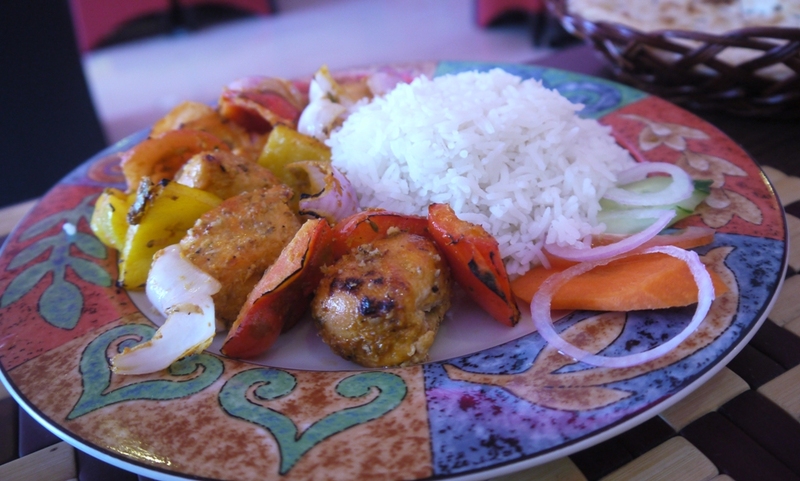 Red Onion Special Chicken (RM 22), we ordered some plain nan to go with this dish. 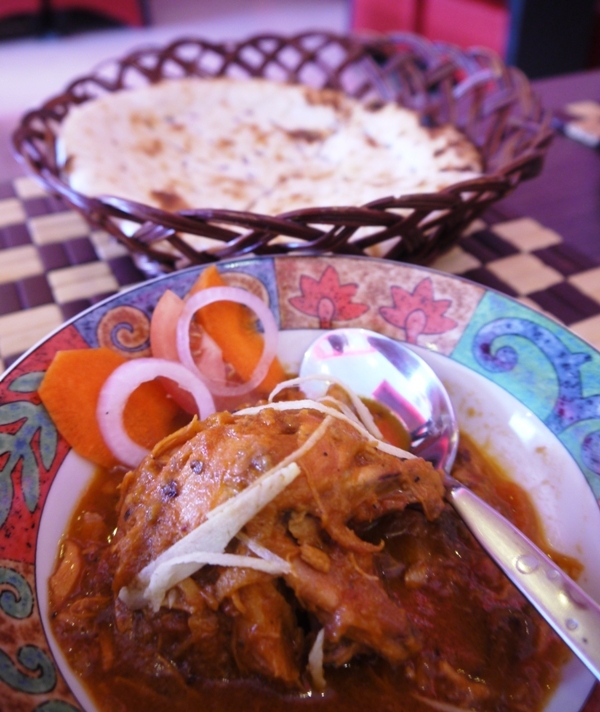 Taste wise- I had to remind myself not to compare with our local curry, but for ease of reference that is what I am going to do, the ‘curry’ is much lighter i.e not as rich as our curry and this was also not spicy. Taste wise- not bad. The nan was nice and fluffy. 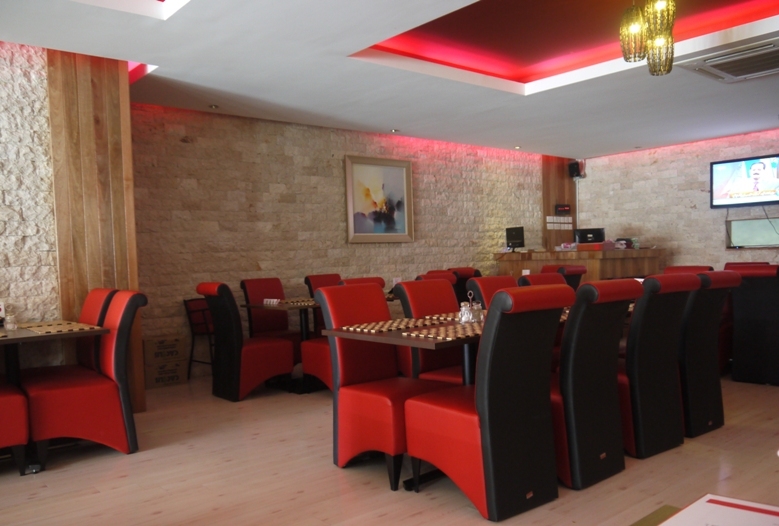 The staff were friendly, we had two of them came by our table to ask us about how we like the food . According to the Manager who came by for a chat at the end of our meal, Red Onion started business about 6 months ago and lunch during the weekends are always slow because people like to sleep in after a late night and they do much better business during dinner time. When I commented that it was difficult to get a parking space, En. 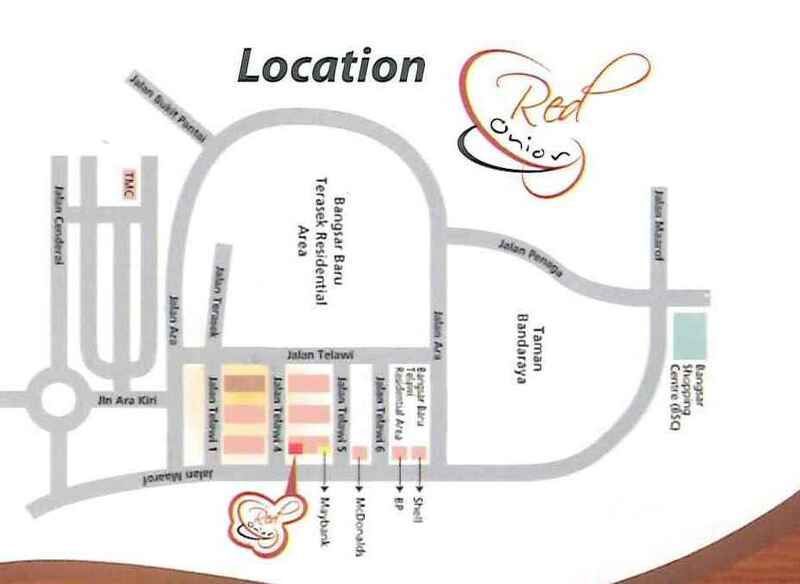 Khalid said that the diners could call them 15 minutes before their arrival and red Onion can reserve a parking spot for the patrons. 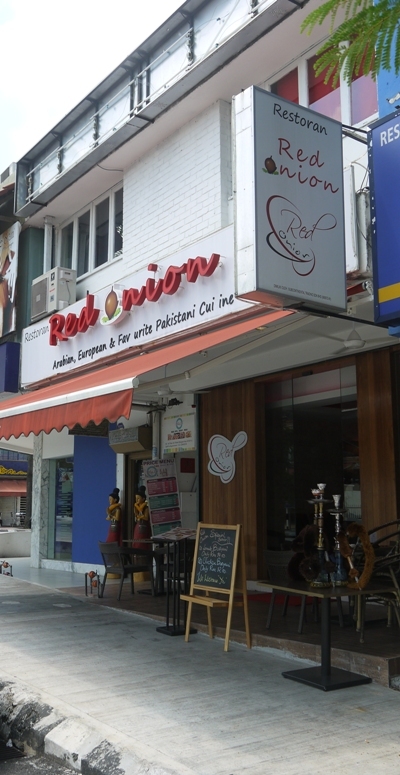 Red Onion is a halal restaurant – En Khalid told us that a Pakistani restaurant would be halal. And we were also told that the chef was formerly working at JW Marriot. 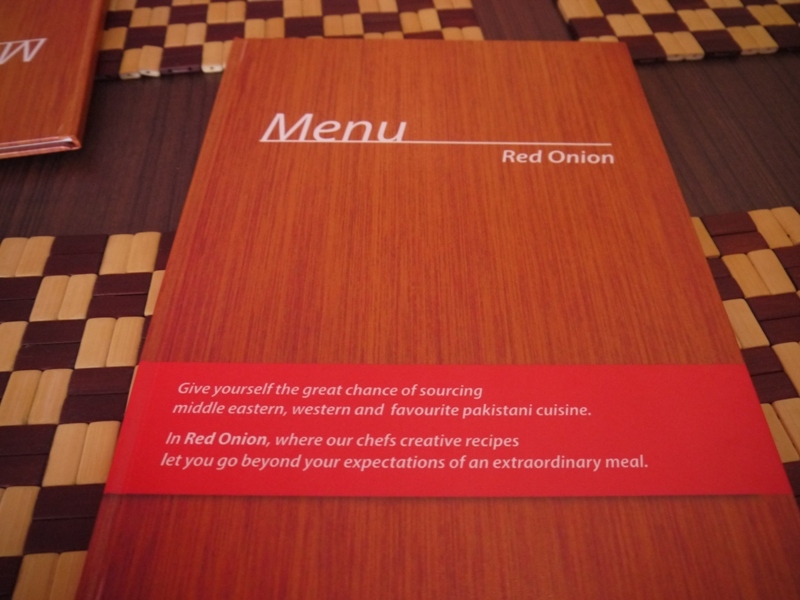 Before we left the restaurant, En Khalid thrust 2 of their pamphlets ( what you see below) into my hands, from the pamphlets- Red Onion also does home delivery and there are no delivery charges . 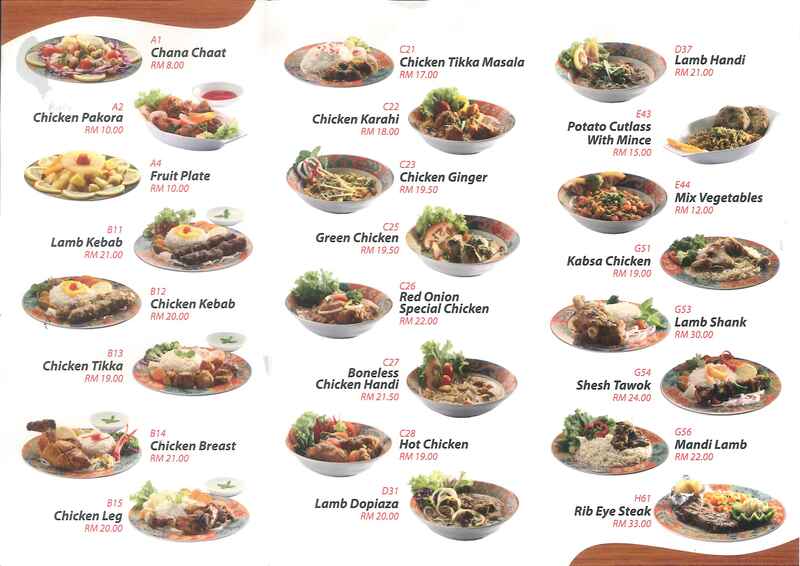 This was another promotional meal from Groupon , the total meal was valued at RM58.20 and one only have to pay RM24. Err..not easy to resist..and at that time we thought that since nobody was going to invite us for Christmas dinner, we have to invite ( and pay) ourselves , desperate time call for desperate measures ! For appetizer, Chunny had the turkey mango crepe and I chose the pumpkin soup.The turkey mango crepe : it was a pleasant surprise ( although it did say it was turkey mango crepe) to bite into mango which adds a freshness to the crepe , this was also aided by the lettuce, the crepe was light and served warm..not bad..
Pumpkin soup – umm.. this taste like pumpkin soup, nothing unusual. Additional point given as the bun was warm. For the main course, it was not too difficult a choice, one would logically chose the more expensive option amongst the lot. So we chose the seafood and the grill and left out the ‘cheaper’ spaghetti. Yeah, we are practical folks. Chunny had the fisherman’s wharf – which was a seafood platter consisting of deep fried scallops, calamari rings, prawns and fish. Taste wise, not too bad, the batter was light and did not overpower the sweetness of the seafood. The Farmer selection was not bad at all, the meat were tender and well marinated, what I liked best was the gravy, I am not sure what gravy it was, but I likeyy. I am not someone who like gravy on my food, but I made an exception for this, it looks like black pepper but didn’t have that hot pepperish taste, it had a bit of sweetish taste to it too.i don’t know what it was but I like it lah. For the appetizer, we chose one each of creme brule and cake of the day- which happen to be green tea cake. When the cake arrive, it looked kinda minute to be costing RM7 as stated on the Groupon deal. The cake was not too bad but we didn’t have much to go around as it was such a tiny piece, I find the texture of the creme brule a bit too liquid-y and it didn’t have that texture and taste of richness to it.